The PlayStation Vita version of BioShock is playing second fiddle to BioShock Infinite, Irrational Games boss Ken Levine told Wired in an interview published today. Levine explained that the studio's focus is presently centered on BioShock Infinite, which is expected to ship for the Xbox 360, PlayStation 3, and PC on October 16. "These games really are all-consuming endeavors," he said. "You do want to keep the ball rolling but it is tough to give it your full attention before you finish what you have. But we're getting there with Infinite. So yeah, we're not as focused on the Vita game as we will be." 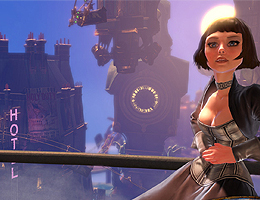 BioShock for the PS Vita was announced at the 2011 Electronic Entertainment Expo during Sony's media briefing. Details were thin at the show, but last October, Levine offered an update on the game, saying it was in the "paper design stage." The developer said he wants BioShock for the PS Vita to be "unique" and "an experiment that's a little different." He also explained that the studio is considering outsourcing the PS Vita version to another developer, but said he is wary about handing control of its IP off to someone else. Are you excited for BioShock? Or do you not care as its taking too long to develop? Let us know in the comments below!